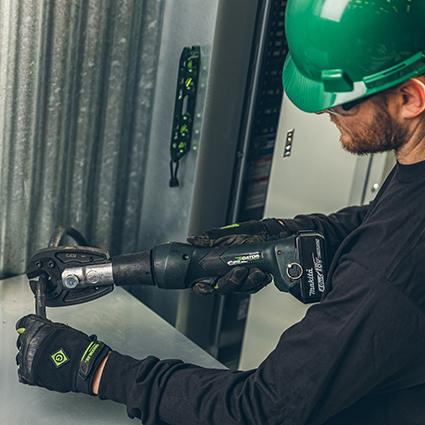 Greenlee’s new cutting jaws expands the current line of cutting and crimping jaws for the EK628/EK425 Gator tools models. These interchangeable jaws provide additional multi-functionality in crimping and cutting on a single tool platform. The CJ-ACSR1 jaw cuts up to 477kcmil Pelican ACSR, 5/16” Guy Strand (EHS), and 3/8” Guy Strand (HS). The CJ-CUAL jaw cuts up to 600kcmil copper (CU) and aluminum (AL) cable. The patented locking pin enables easy jaw installation and removal – simply select, change and cut. The first truly automated solution for measuring, notching and cutting clad cable. Once the operator enters the parameters for whip requirements during initial setup, the machine does the rest. Stores information on up to 48 different cables and 96 whip configurations. The C3 Auto Whip™ is faster than manual operation offering lights out capability, intuitive operation, and improved safety.